SportsAction365.com provides College Football odds updated daily every 5 minutes for your viewing pleasure. The NCAA Football odds listed below are the most current College Football lines from GT Bets Sportsbook's football betting section. If you would like to place bets on any of the College Football betting odds listed below, than you can simply click on the pointspreads or moneylines below and it will take you directly to GT Bets Sportsbook. 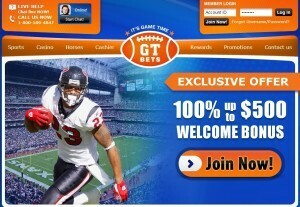 As an added bonus for being a SportsAction365.com viewer, GT Bets Sportsbook will reward you with a 100% BONUS when you deposit funds into your new GT Bets sportsbook account. Please visit our sportsbook bonus page for more information on GT Bets Sportsbook and more endorsed online sportsbooks that we recommend. As always, feel free to give our customer service department a call toll-free at 1-866-222-8848 or send an email to info@sportsaction365.com if you have any questions on College Football odds or football betting online with internet sportsbooks. WIN and WIN BIG this football season with the nation's #1 football handicapping service(77% 100* WINNERS the last 5 years)! Visit our website daily this football season for winning College Football Picks, NFL Picks, and Free Football Picks. SportsAction365.com takes pride in being recognized as the nation's #1 College Football handicapping service and we look forward to providing the very best College Football Predictions from preseason all the way thru the BCS National Championship Game!